It’s a wonderful thing one when a film turns out living up to the anticipation surrounding it. I always look forward to the latest from Joel and Ethan Coen, two brothers who’ve been making memorable films for decades, but when I heard their latest film would be touching upon the Greenwich Village folk scene in the early 60s and reuniting with musical director T Bone Burnett (“O Brother, Where Art Thou?”), my interest increased, being a fan of that particular singer/songwriter scene. 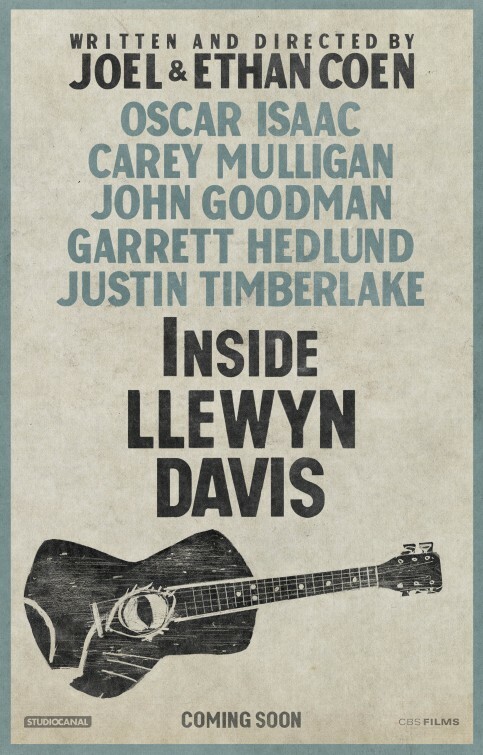 “Inside Llewyn Davis” offers a week in the life of a restless folk singer, who can’t seem to find his place in life. While the film has many of the trademark Coen-isms, for me, this is their most affective film to date. 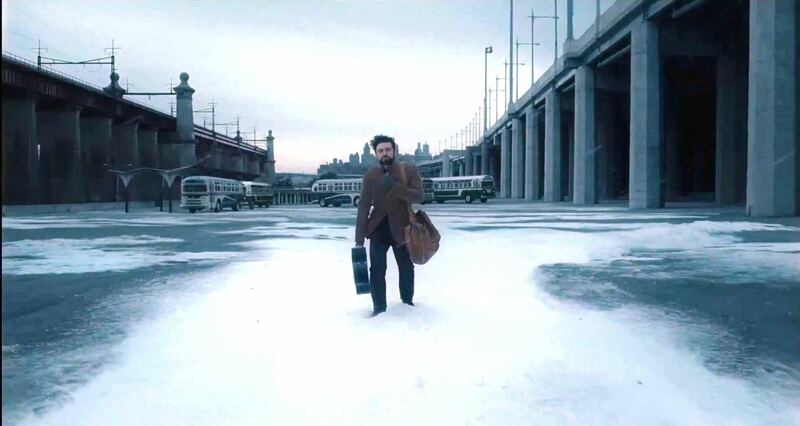 It’s February 1961 and Llewyn Davis (Oscar Isaac) has no place to call his own during an unforgiving New York City winter. He either crashes on the couch of academic luminaries, the Gorfeins, in their Upper West Side apartment or lays his head on the floor of friends and fellow performers, his icy ex-girlfriend, Jean (Carey Mulligan) and her current square-bearded boyfriend, Jim (Justin Timberlake), in the West Village. Too broke to afford a winter coat, Llewyn can only land gigs at the Gaslight Cafe, because he nows the owner, Pappi (Max Casella), but his surly and defeated attitude doesn’t seem to win over audiences. Thing is, that attitude may be warranted. Llewyn (pronounced Lou-In) used to be part of a successful duo and now his solo album Inside Llewyn Davis isn’t selling as hoped. He’s getting tired of not making it, hitting his sister (Jeanine Serralles) up for money and weary of performing the same folk songs without his career taking off. His disdain for other people’s success and the effects of rejection have made him a difficult character to befriend – that is, for the few friends he has. His one break is an invitation from Jim to record a novelty song “Please Mr. Kennedy (I Don’t Wanna Go)” – a fun anti-Vietnam song – with another singer/songwriter, Al Cody (Adam Driver) as the John Glenn Singers. He does so reluctantly, since it’s not his kind of music and only gets a flat rate with no royalties. Seeing as how no other work is coming his way, Llewyn embarks on a trip to Chicago, hoping to catch a break there. He hitches a ride with beatnik poet, Johnny Five (Garrett Hedlund), who is chauffeuring the gruff Roland Turner (John Goodman), an alleged jazz musician who only has sneering remarks about folk music. It’s definitely one of the more strange and awkward road trips I’ve seen on-screen. The discouraged singer hopes to gain the attention of Bud Grossman (F. Murray Abraham) at a place called the Gate of Horn in the Windy City, to get one last shot at success before hanging it all up and re-enlisting with the merchant marines. The character Llewyn Davis is loosely based on real-life folksinger Dave Van Ronk (who had an album entitled “Inside Dave Van Ronk”), set in the time right before Bob Dylan came on the scene. Using Von Ronk as a template – I’m sure they used Van Ronk’s memoir The Mayor of MacDougal Street for inspiration as well – the Coen Brothers take viewers on a wandering journey that affectionately captures both the atmosphere of the time and the artistic desperation of their protagonist. For Coen fans wondering how similar “Inside Llewyn Davis” is to their other films, one can compare it to “A Serious Man” and “O Brother, Where Art Thou?”. It has the same introspective study of its lead character as “A Serious Man” and music plays as much a large role here as it did in “O Brother”, even moreso here since the film revolves around a troubled musician looking to shake off the static state of his career, while dealing with the death of his former musical partner. The Coens open the film with Llewyn performing “Hang Me, Oh Hang Me” at the Gaslight in its entirety. This introduces us to the storytelling process the Coens use here, straying away from a plot-driven narrative, the writer/directors allow the music to tell the story. It’s a fitting and absorbing approach. At no point did I wonder where “Inside Llewyn Davis” was going or what the film was trying to say. That’s partly due to the magnetic performance from Isaac (who does all the singing in the film, as does every other actor), but also due to the Coens straightforward screenplay. They allow the characters – and especially the addictive music of the film – to draw in their audience, letting viewers arrive on their own feelings about what they’re watching. Naturally, we want the man we’re following to succeed as he tries to overcome obstacles, but Llewyn doesn’t make it easy for us. His bad decisions and eruptive behavior are bookended by an altercation he’s involved in after he heckles a woman performing one night at the Gaslight. Llewyn’s is often the source of his own undoing, as his behavior continuously gets in the way of his own success or happiness. He’s a cynic, a womanizer, a user and claims only to approach his art form as “a job”, which may be a self-defense mechanism he’s built-up over the years. 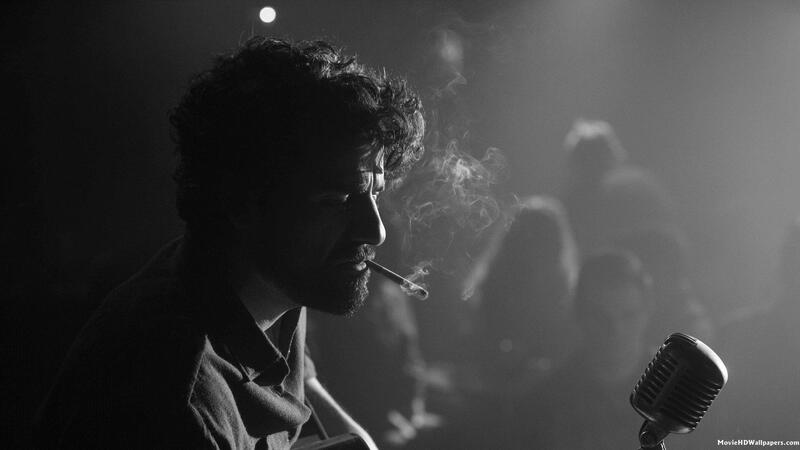 Llewyn serves as a reminder that artists can be unpleasant and dishonest, while the music itself can still coming across as appealing. Like every Coen Brothers film, a great deal of attention has gone into the film’s setting, which feels like a character all its own. The production design by Jess Gonchor and art direction by Deborah Jensen (two frequent Coen collaborators) is flawless, getting the period details dead right. Every interior, from a smokey cafe to the Gorfeins’ apartment, feels used and lived-in. All of it emphasizes the cold and windy conditions of the season, where a chilliness can be felt from the cramped apartments Llewyn frequents. Add the ambient cinematography from Bruno Delbonnel (their usual cinematographer, Roger Deakins, was busy shooting “Skyfall”), which utilizes a muted palette, with gray tones that blanket the almost colorless, dull and inhospitable Manhattan, and you have rich and atmospheric picture. 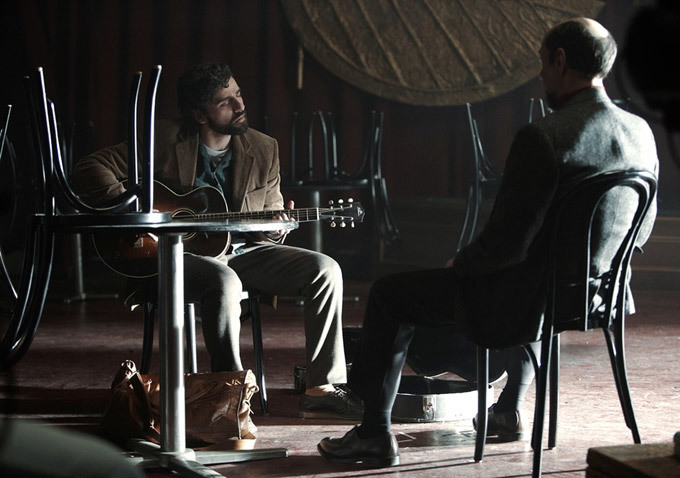 The most effective display of cinematography and direction from the Coens comes in Chicago when Llewyn plays a song for the lofty Bud Grossman. The two of them sit in a large dark auditorium (that feels like a gigantic aircraft hangar) where shafts of light beam down as if to provide a spotlight for the vulnerable singer. His heartfelt rendition of “The Death of Queen Anne” is one of the film’s most somber performances and Grossman’s response to it, is one of the most humiliating. Everything about this scene, from the lighting to the acting, is perfect. The tone of the film is not all bleak and depressing though. One particularly humorous subplot involves an orange tabby cat that escapes the Gorfeins’ apartment, compelling Llewyn to take the cat with him. But, it won’t be the last time the cat, named Ulysses, escapes, causing Llewyn to dispense energy on someone other than himself. The cat is a welcome character in the film, detracting Llewyn from the pains of his dwindling music career and given him something precious and on him to take care of. There are other scenes that are quite revelatory, like when Llewyn visits his ailing father and plays “The Shoals of Herring” for the unresponsive former merchant marine. But that solitary scene at the Gate of Horn is most memorable, most indicative of the pain and vulnerability that comes with putting your talent out there. Oscar Isaac, an actor I’ve come to admire since first catching my attention in “Drive” in 2011, is quite a find for the role of Llewyn Davis. He displays as much defeat as he does determination with his expressions. His tired eyes have been numbed by life’s weary path. There’s a palpable ambivalence that Isaac portrays here, except when the classic folk songs he performs provides an escape from himself and his surroundings. Isaac also has a heck of a voice too, one that suits the storytelling style of a Woody Guthrie or Leadbelly. Timberlake and Mulligan have equally impressive singing voices as well. Viewers are aware of Timberlake’s capabilities, but those who hadn’t seen Mulligan croon in “Shame” might be surprised. Undeniably though the most enjoyable song is “Please Mr. Kennedy”, an infectious diddy that serves as a nice break from all the reflective songs. Of course, with this being a Coen Brothers film, it has to be populated by naturalistic supporting characters. Two of them, Llewyn’s manager Mel Novikoff (Jerry Grayson) and his ancient secretary (Sylvia Kauders) can be found in the dusty office of Llewyn’s dilapidated record label. Like many of the ancillary characters in “A Serious Man” and “No Country for Old Men”, these two characters (as well as a handful of others) populate the film with real people, giving the film a feeling of authenticity and believability – and, of course, some good laughs. 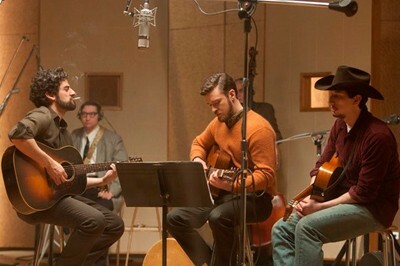 While “Inside Llewyn Davis” may feel like a Coen Brothers film, but it’s unlike anything they’ve ever done. It’s their most personal and intimate story. It may not be their best film, but it belongs right beside them and remains their most powerful character-driven tale with probably the most relatable lead character of all their films. After all, there are plenty of artists out there who’ve acted like jerks, made mistakes and felt beaten-down by life’s wrong turns. Anyone can respond to that.